In addition to my sister’s wedding in the Valley of Fire the highlight of Las Vegas was visiting In-N-Out Burger. 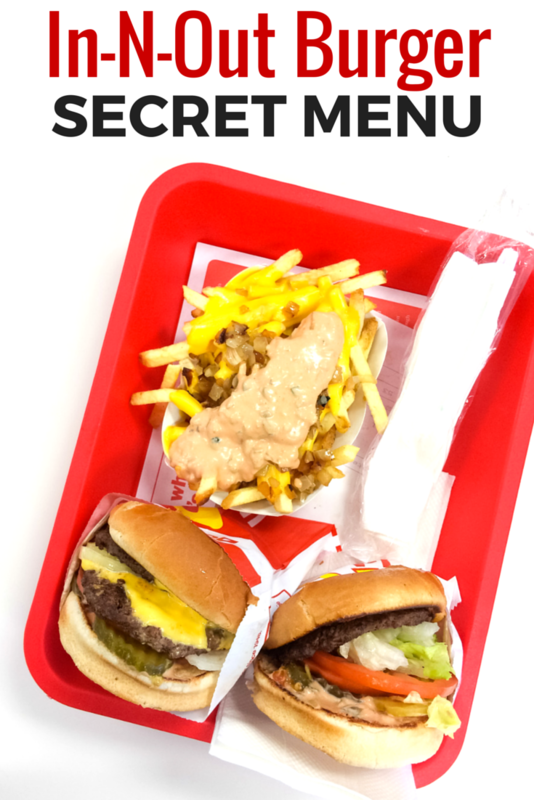 It was highly anticipated, which was why I needed to dig deep into the internet to find the In-N-Out Burger Secret Menu. 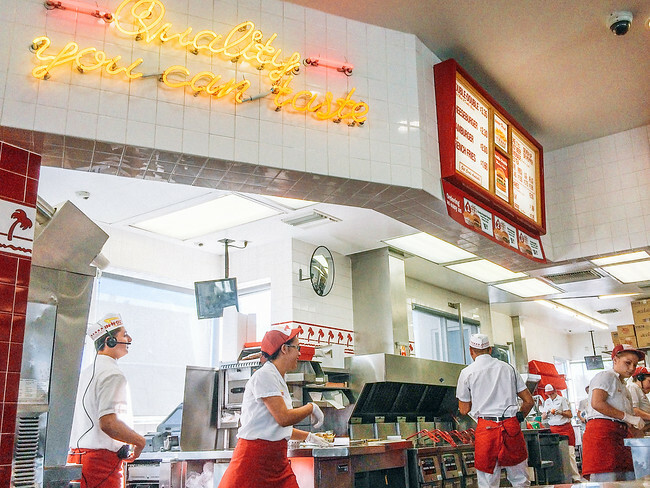 California’s first drive thru burger joint, the beauty of In-N-Out Burger is a super simple menu of burgers, shakes and fries. And of course if you want to get crazy a Double-Double. They focus on a few things and do them really well. But… if you want it’s possible to take those items and reinvent them into new awesome menu items. However, the secret menu isn’t so secret. Furthermore, it’s well documented by regulars. 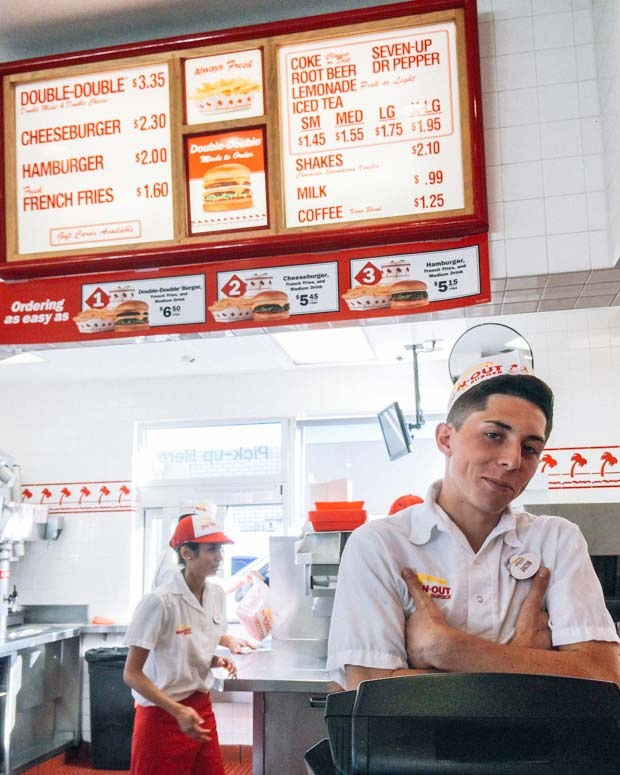 In fact, In-N-Out Burger has buttons on the cash register for the most popular items and a link to its not so secret menu. Check out Torchy’s secret menu, the off-menu tacos at this famous Austin taqueria. Seems like a Double-Double isn’t enough for you? You can supersize it and ask for a 3×3 or 4×4 – which is 4 cheeseburgers packed on top for each other. It was once possible to get even more but of course college guys in the Sin City location pushed their luck will 100×100 and since then it’s been limited to 4. But even with these official items, many new secret menu items have been created over the years. Protein Style is a regular burger without the bun, wrapped in lettuce. The Scooby Snack is a single grilled patty. The Flying Dutchman includes two slices of cheese melted between meat patties. The Flying Dutchman Animal Style adds diced onions between the cheese. Grilled Cheese: cheese between two toasted buns. Cheesy Wiki: three slices of cheese with four slices of tomato on a double toasted bun. Wish Burger: a toasted burger with lettuce and tomato, you can add the usual onions, spread, and pickles. Most noteworthy: vegetarians should double check to see if the items are cooked on the burger grill. I had to have the Animal Style Fries, who could pass up fries with cheese, spread and grilled onions. While people rave about the burgers, fries at In-N-Out Burger are controversial and many criticize they are too soggy so you can ask for them to be cooked well done or fries light well which are crunchier but not overcooked. First of all, they come as a fresh slice by default. In addition, raw chopped, chopped grilled, and whole grilled onions are available by request. Mustard fried is a must! The burger is spread with mustard, then grilled. The hot grill burns the tasty mustard into the patty. Because we loved it so much we now do it at home. Yellow chilies are available on the burger whole, chopped or on the side. Medium rare is available if you ask. Double toasted bun or not toasted at all. Cold cheese can be ordered on the cheeseburger if you don’t want it melted. Cut in half perfect for families. No salt or extra salt – who orders extra salt at a fast food joint??? Black and white is also known as a chocolate vanilla swirl. Neapolitan is chocolate, strawberry and vanilla combined. Around the World all of the shake flavours combined. Root beer float is half vanilla shake and half root beer. You can have it split 50/50 or any ratio you’d like. Arnold Palmer with lemonade and ice tea. You can also order a large shake in a medium cup or ask for a split shake for two kids to share. No Monkey Burger – also known as fries on a burger. Maybe because they are cooked at different stations? No Lemon Fries which are simply fries with a squeeze from a lemon wedge. Do you love trying fast food around the world? Check out Bembos burger in Peru, El Corral in Colombia, or Boon burger: vegan burger in Winnipeg. Growing up & living in SoCal, I’ve been spoiled when it comes to In N Out. Am I biased in saying that it’s the BEST fast food burger joint in the world? Yes (sorry Five Guys fanboys)! PS. 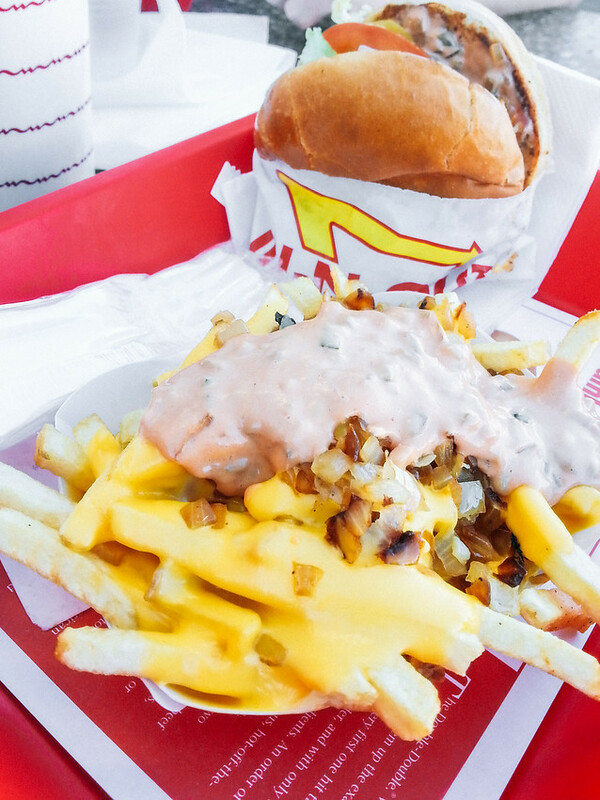 I’ve always loved In N Out fries the normal way but for those who don’t…try them well done, it’ll change your life! Have you tried What-a-burger yet? May change your perception a bit lol. In my opinion better than In-N-Out, but they may be a bit different here in Texas. Joey, you are exactly right. In N Out doesn’t hold a candle to Whataburger. Although not fast food joints their are many burgers that rival In And Out if your in the right area. One if the best is The Deli Man in Beltline in Coppell Tx and its sister joint The Coppell Deli. That about as close to perfection as a burger can get. Whataburger uses frozen, never fresh patties. There is no way someone with properly functioning taste buds could state that Whata…is better than In N Out. I would have to disagree. I don’t like anything about whataburger. I’ve tried it 3 times now and still very disappointed. I had whataburger in Dallas and was not impressed. Same with shake shack in NYC. Sorry, InNOut is best. I’m actually not a fan of their whataburger. I prefer the items on the all time favorites menu like the Honey BBQ Chicken Strip Sandwich, Patty Melt, Sweet Spicy BBQ bacon burger and the Monterrey Melt. Also loved the A1 Thick and Hearty and Chophouse Cheddar burgers. Really, ordering a whataburger from there is like ordering off the regular menu at In N Out. Whataburger is right there with Sonic for the most bland burger. There is no taste. That may be why they add so many toppings to give it some taste. Why else the Sweet Spicy BBQ bacon burger? In and Out is the best, no matter where I’ve had them. I’ve had White Castle, whataburger, 5Guys & Shake Shack. None of them stack up to IAOB. But if you’re into craft lux burgers….. try Fathers Office or Rustic Canyon. What is lOAB? Why do people use acronyms when some of us don’t know what they are talking about? First, you have to get the acronym right. He wrote IAOB. That stands for In And Out Burger. I’m pretty sure he didn’t mean to complicate things for you. If you live in Cali, In N Out & Fat Burgers is a must. Nice weather, burgers, milk shake, everyone has their fav little taco stand of course, cruising to the beach and relax the So-Cal way. Thanks for the secret menu, didn’t know about the mustard fried. The Animal style fries are my sons favorite. Glad to see they wear gloves now. I was so grossed out when I went to one in LA in 2012 and they were using their bare hands to prepare my burger! Despite my shock when seeing it, I did enjoy the burger. 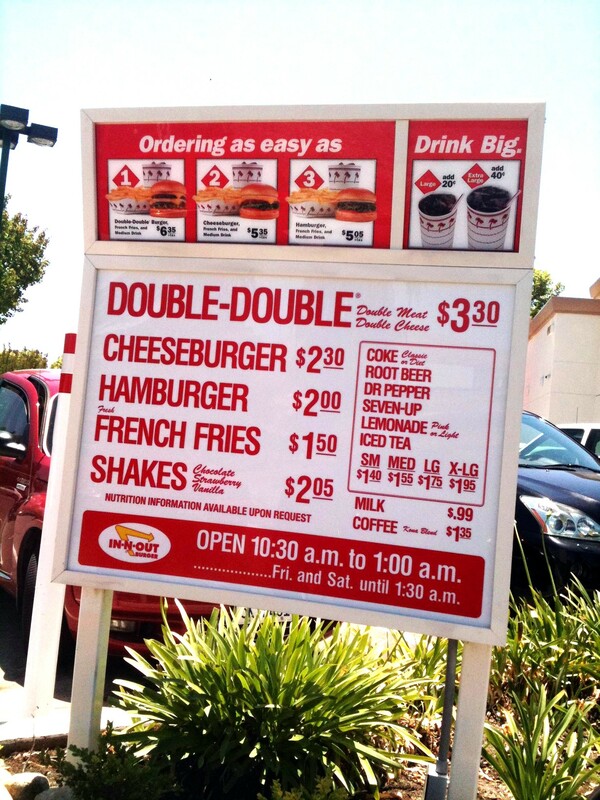 Thanks for this guide though, now I know exactly what to order when I get back out to Cali! WOW. 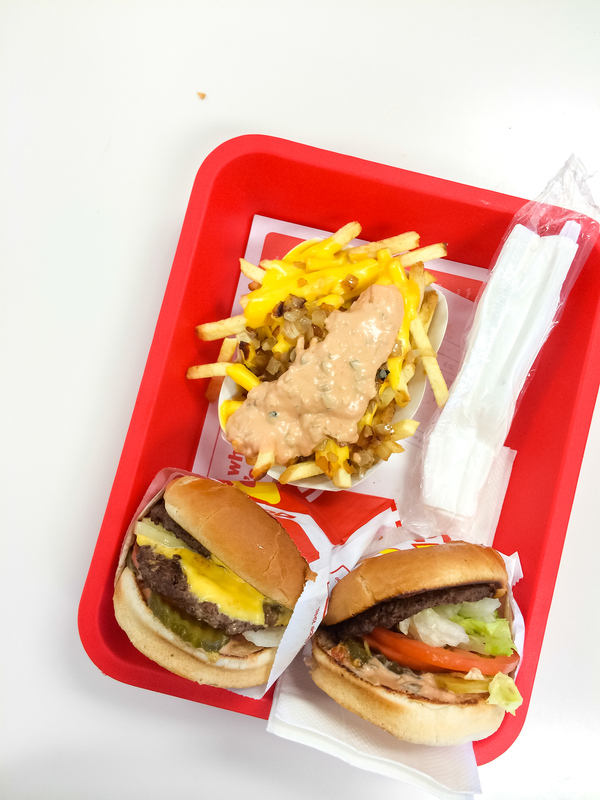 I didn’t realize just how much I missed In-n-Out until I read this post and you left me drooling by the end. It’s definitely the best fast food burger place in California. How did you find all this information out?? I wonder why they won’t do “Roadkill Fries” or a “Monkey Burger.” Those both sound awesome. Heard about the secret menu but never knew what was on it. The mustard fried sounds delish! Great list! There were actually a couple things on here I didn’t know about. So what do you get if you order a large shake in a medium cup? Sounds like a mess! Thx for this awesome post! 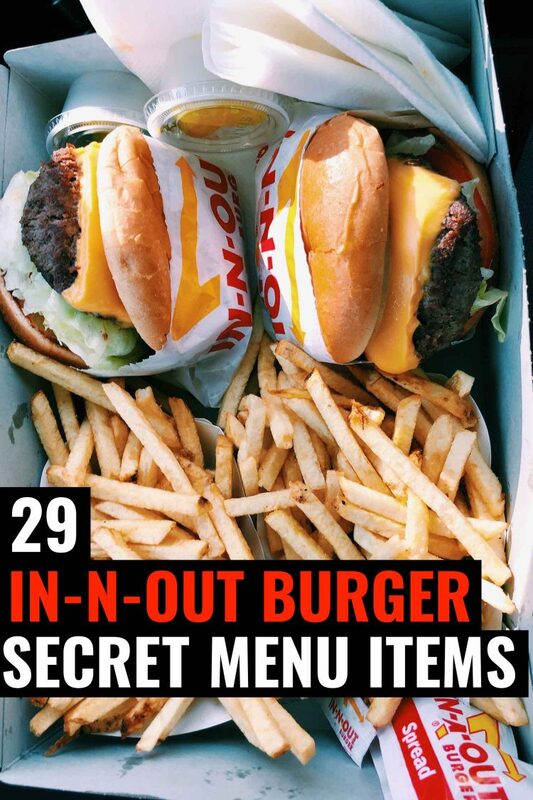 Have been eating In-N-Out for years, and had no clue about half the items on your list! Wonderful tip . Always I ate there and never knew the secret menu. I have been eating at the In-N-Out since i was 12 years old. My worst years of my life were the years i moved to the East Coast. As you know there is no In-N-Out Burger there. They have the best burgers from coast to coast. I miss your 4x4s and your animal style fries so much. I just learned about your Flying Dutchman Animal Style this minute and can’t wait to try it. Keep up the good work. See ya soon. Awesome, so glad you found this helpful! New Orleans isn’t big on chain restaurants, and, that is not a bad thing. 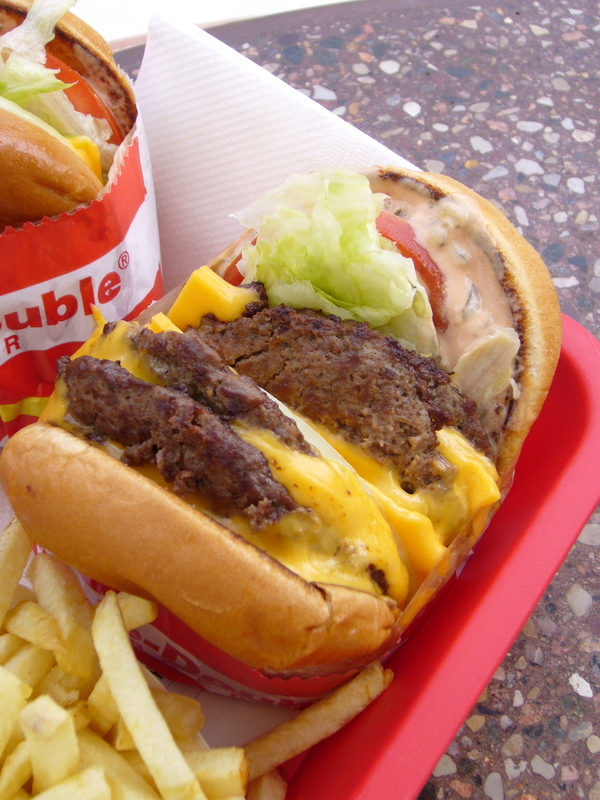 I do agree that as far as fast burgers go In-N-Out is the best. Medium- rare burgers are no more. California banned them for fast-food chains as of Jan. 1. Same in Canada, I guess we have other states to eat it in. Cannot U make bigger fries? Your fries are terrible: lots of bits & pieces I hafta toss. Overcooked and too hard and dry. Making bigger fries [like Nation’s Burgers] would make them tastier with the ketchup I put on them. The size of the individual fries will vary, because they are cut from actual potatoes. For those who have never seen one, potatoes also vary in size and have a rounded shape, so some fries will be shorter than others. One thing not mentioned is variety on the fries. You can get ‘extra well done’, ‘extra-extra’, or ‘extra-extra-extra’. Can’t imagine eating or needing ‘bigger’ fries! Love ’em as they are only ‘extra-extra’ well done. Two extra’s. That’s a fantastic addition, thank you! I’ve run into little bits of fries … I don’t like them either. Their fries are supposed to be the length of a potato and too often it seems the potato is not cut lengthwise but along the shorted end, and sometimes even shorter. Next time, might need to ask for the proper cut when ordering. An around the world is a term the associates use to communicate that three different shakes in three different cups need to be made. (Chocolate, Vanilla, Strawberry) But a Neopolitan is the one with all three in the same cup. Carls or Hardees is still the BEST Ant clown can fry a burger! ive been doing it since I was 10 yrs old! My burgers are better! And No millennial finger prints! Their beef comes from Harris Ranch and they only use USDA Prime Angus beef chuck. The lettuce and tomatoes are all contract grown like the potatoes. It is very much artisanal style “fast food”. The chain started by the Snyder family in Pasadena California and the concept was ripped off by the MacDonald’s franchise ( Golden Lightening bolt became golden arch, white tile with red accents, thin patties grilled on a flat top, and show string fries…. the difference is In n Out actually tastes great. McDonald’s was founded 8 years before In-N-Out and In-N-Out was founded in Baldwin Park, not Pasadena. Cheese that’s only 51 o/o cheese? 50 cars in line at our newly opened In-N-Out, open 5 days and we still can’t get close! They should have made it for you. What did they say? Please open in UK. Pleeease. Can I request gloves with my Flying Dutchman? Can you order latex gloves upon request? In & Out Burger is the very BEST fast food burger place. You were my go to food place when I lived in Calif.
What a burger is great if u like cardboard! I don’t live in Tx but it’s the worst burger ever!